There’s no shortage of home security cameras. From Nest’s line of indoor and outdoor cameras to Ring’s series of floodlight cams, it’s definitely a crowded market. These days, you can buy everything from a basic no-frills security camera to one with lots of bells and whistles, including a floodlight, siren, and high-resolution video, all rolled into one. 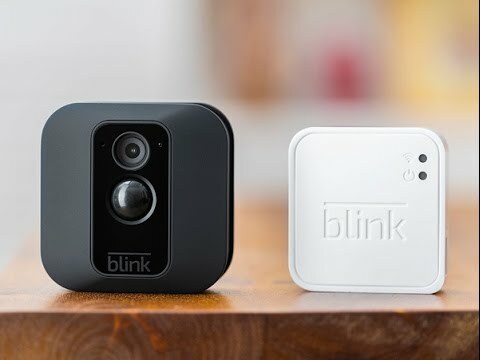 Blink, founded in 2008 and recently purchased by Amazon, has carved out space in the home security category with small, battery-operated cameras that you can put indoors or outdoors. They have their limitations, but depending on what you’re looking for, their cameras could be a great fit for your home, especially if you’re just getting started with home security products. The Blink XT camera ($130 on Amazon for a single camera and cloud storage) is Blink’s battery operated outdoor camera. So how does it measure up against the Arlo Pro 2s of the world? Read on to find out. SMART HOME VIDEO SECURITY WITH HD VIDEO: Simple self-install home monitoring in minutes; easy control wireless cameras with the included iOS & Android apps or via voice through our Amazon Alexa Skill! Once we got the device up and running and connected to the app, we found that there’s a lot to appreciate about this camera. It’s got a decent app, looks simple, and works as promised. Here are a few other things we liked about the device. We found that we could rely on it to record motion pretty reliably. We received notifications every time motion was detected, although sometimes we’d be notified right away and sometimes there was a delay of up to 15 seconds. One thing we noticed that had nothing to do with the camera is how often a UPS or FedEx delivery person would leave a package on our porch without bothering to ring the doorbell (thanks a lot, UPS guy!). We tried to trick the camera by hiding in front of the porch and waving just a hand, but the camera reliably caught the movement each time and sent us a notification. It’s good the motion detection was reliable, because the device only records when it detects movement. Those recordings are called “Motion Clips,” and are viewable via the app. You can customize how long you want the clips to be once motion is detected, and it will continue to record if it continues to detect movement. You can always view the live action through the app, but you can’t record live action while watching it. Cloud storage is free. Yep, free – though it’s not unlimited storage. The Blink website says you receive 7,200 seconds of storage before new footage records over the old stuff. Not having to pay for access to your own video footage is a great perk for an inexpensive camera. For example, Ring’s cloud storage starts at $3 per month or $30 per year, while Arlo’s premium plans start at $99 per year. This is a huge plus if you’re not into having unsightly power cords running down the side of your house. Having the ability to set it up and be wire-free just looks nicer and eliminates any concerns about the camera going black during power outages. We found ourselves admiring how tidy the device looked on its little mount above our front door without any cords connected to it. Not only is the camera free of anything weighing it down, but it takes AA lithium batteries to power it, which is convenient for obvious reasons. No expensive batteries or battery packs are needed to operate the XT. Blink claims all its cameras have a two-year battery life with regular usage. While we haven’t had the XT in our test home for that long, we have had the Blink indoor camera in our home for more than two years, and just received the first low battery warning on one of them. Only time will tell if the XT has the same capability. While we mounted our Blink XT on a covered porch, we like that we could mount it on our garage door, or an exposed side of our house, and not worry about dealing with a dead camera later. We did leave it out uncovered in direct rain for a couple of days, and the camera had no problems. This is where the ease of a cordless, battery-powered device comes in. You can put it anywhere, even your forested backyard, in case you want to track Bigfoot. The Blink XT comes with a 30-day refund guarantee and a one-year limited warranty. While many will find quite a bit to like in the Blink XT, others might be left wanting more. For example, you’re not going to get stellar video quality with this device, nor will you be able to record live video footage.